I thought I knew a lot about the history of art museums before I was asked to proofread this fascinating, challenging book copublished by the Rhode Island School of Design Museum and MIT Press. Why Art Museums? The Unfinished Work of Alexander Dorner tells the story of the brilliant, visionary, and controversial director of the RISD Museum in the late 1930s and early 1940s. 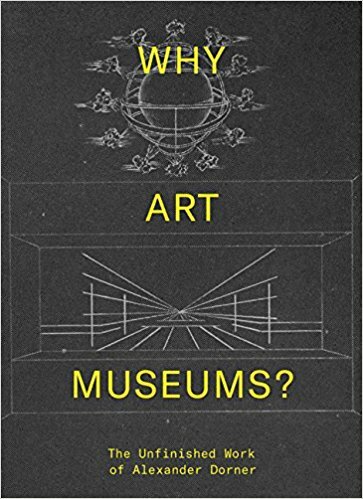 It also parses Dorner’s theories and philosophy about the role of art museums in modern culture, a timely conversation as arts and cultural institutions seek to “decolonize” their collections and galleries. The book is edited by Sara Ganz Blythe and Andrew Martinez, both of RISD, and includes essays by Blythe, Martinez, Rebecca Uchill, Dietrich Neumann, and Daniel Harkett. It also includes an unabridged facsimile of Dorner’s influential 1941 volume, Why Have Art Museums?